My wish for every rider is that they get to ride a great horse in a great saddle with a great trainer: the resulting joy inspires greater living...for horses and their humans. Go to the Custom Saddle website; click on the logo above. The girls at Karver's Creek Farm train and compete in Custom Saddles. 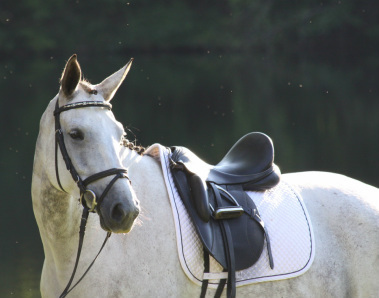 Wonderful Pearle is a 2006 Hanoverian mare and goes by the stable name "Wonder". She is trained by Jeanne Karver in her Custom saddle. Sanibelle is a 2006 Oldenburg mare owned by Susan Craft. She is trained by Jeanne Karver in her Custom saddle. North Carolina based artist uses oil on canvas to capture rich, saturated color and texture. 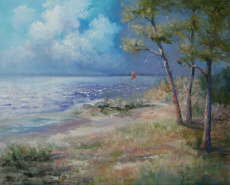 My mother, Carolyn Rush, produces unique oil paintings. 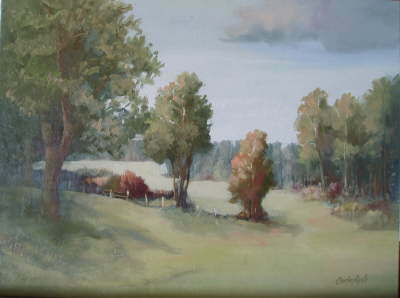 The works are displayed in some NC galleries. 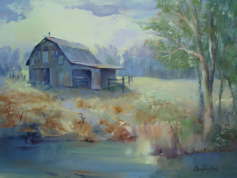 The most popular subject matter is landscape. 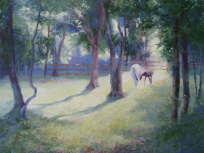 She also does other subjects including horses. However, her oil paintings are very dimensional and layered, therefore they can only express themselves to their full potential in their original form. A photo or computer reduces the saturation of color, completely masks texture, and barely portrays any feel. They often evoke deeply emotional responses when seen in person. If you like a piece on screen, you should to arrange to see it in person. Please contact Jeanne Karver or Carolyn Rush. Enjoy: www.CarolynRush.com Click on a picture to enlarge. I would like to thank Elizabeth Moore at Pacific Cove Designs for my logo! It was such an easy and pleasant experience to create it and it turned out just as I wanted. Thank you. I would like to thank Thread Bear in Greensboro for their excellent effort to put my logo, as wearable art, on many different fabrics and colors. Their expertise and attention to detail is outstanding. I highly recommend them for any embroidery needs. Click here: USDF For national information on dressage awards, educational programs, licensed officials, calendar, show results, news and more, go to the United States Dressage Federation website. Become a member and get the directory and magazine included. 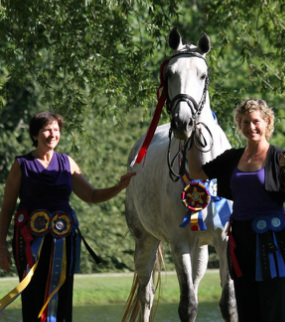 Click here: USEF For information on all sporthorse disciplines including dressage, jumpers, hunters, driving, eventing, endurance, etc. go to the United States Equestrian Federation website.